This story should raise some important questions about organised crime’s influence on our judicial and economic systems – in times of crisis. A recent money laundering investigation by a British Newspaper, The Independent (see story below), reveals a complex accounting and legal shell game of British-based front companies, laundering their illicit proceeds through phony lawsuits, followed by massive wire transfers to Latvian and other banks. Money transfers are effectively rubber stamped by “corrupt Moldovan judges”. Are these white collar crimes exclusive eastern European gangsters, or do well-known British financial brands also do the same? FOLLOW THE BALL: Dirty white collar criminals have devised a new complex system to move their funds. This scam uncovered is said to have lasted four years already, and British and European law enforcement investigators claim that it’s been shut down since May 2014, following a clampdown on the judicial component of the fraud chain – in the former Soviet republic of Moldova. Yes, this is a scandal of sorts, but how big is it really? Investigators claim over £20 billion has been laundered in this way, but as we will show you – it’s only a drop in the global crime bucket. 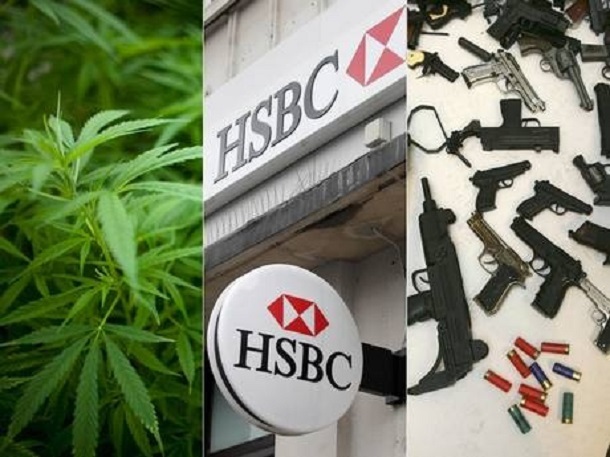 Let’s just put this into perspective in relation to some of the world’s largest and “most respected banks” who all seem to be engaged in the macro-money laundering of arms, narcotics, and human trafficking. Take for example, HSBC, a major clearing house for dirty money worldwide. UN Drugs and Crime records also reveal, “Gangs are now believed to make most of their profits from the drugs trade and are estimated to be worth £352bn“. International policy smokescreen, like Washington DC’s infamous War on Terror have also provided a smokescreen for opaque agencies like the CIA to profit from criminal enterprises like drugs, money laundering and human trafficking. The current criminal banking cartel mentioned above has simply replaced the CIA’s former clearing house for its drugs and organized crime fortunes, the Bank of Credit and Commerce International, aka the BCCI. As we reported last year, the current US Secretary of State John Kerry was instrumental at the time as Senate chair of the investigation, in covering up the dirty CIA deals festering throughout the CIA’s classified, and highly criminal, BCCI network. Read more about the incredible financial network of international elites, found here by author Dean Henderson. This generalisation that Russia is the center of organised crime is somewhat of a politicised lie. More amusing is Armitage talking-up Britain’s supposedly advanced and highly “robust legal system” (arguably as corrupt as any other in the world), when any sucker knows that if you are not a member of The Club, you will be destroyed when you step into a British Court frequented by crooks and criminals hiding behind the black robes, who speak their own coded language and wear sheep skins on their heads. Author Jim Armitage (or his editor) has casually dropped in that sweeping statement, which seems to be attempting to underline a British media narrative that, somehow, that the bulk of global organised crime money goes through Russia, which is not true. It’s another nail in the anti-Russian PR campaign. Very clever and very subtle. Remember, when you see these politicised jibes in British media, you are hearing the voice of MI5. Front companies in the UK are at the heart of an investigation into one of Europe’s biggest money-laundering operations, allegedly forming part of a conspiracy to make $20bn (£12.5bn) of dirty money look legitimate. The funds are believed to have come from major criminals and corrupt officials around the world wanting to make their ill-gotten cash appear “clean”, so they can spend it without suspicion. An investigation by The Independent and the Organised Crime and Corruption Reporting Project, an NGO, has identified dozens of firms in a global web spreading from Birmingham to Belize.